Groundwater is a critical resource in Yolo County. The cities of Woodland, Davis and Winters, as well as UC Davis and many farms rely on groundwater to meet residential and agricultural water demands. Because groundwater is of such importance, the District collaborates with the cities and other entities to gather information on groundwater levels and quality. Groundwater quality is of concern with respect to the presence of natural occurring minerals as well as man-made chemicals such as pesticides, hydrocarbons and pharmaceutical compounds. Measurements of groundwater levels are necessary to evaluate aquifer storage capacity and subsidence prevention. The data gathered will be used to evaluate groundwater quality and to identify the natural and human factors that affect changes in water quality. 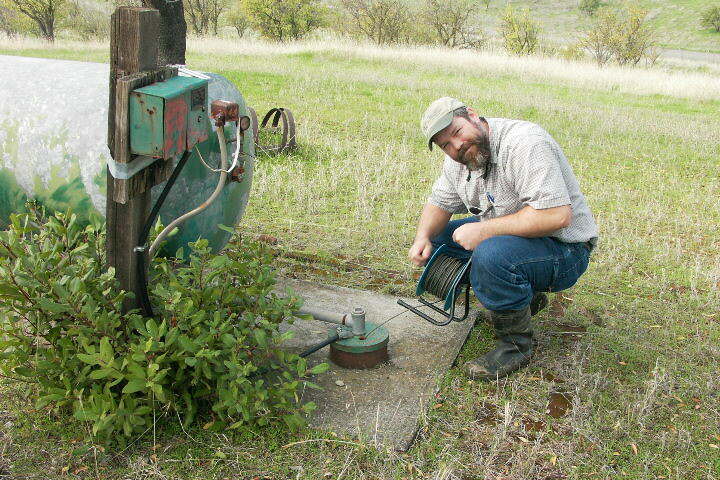 Max Stevenson, YCFCWCD’s Water Resource Associate is measuring the depth of water in this well, as part of the Groundwater Monitoring Program.